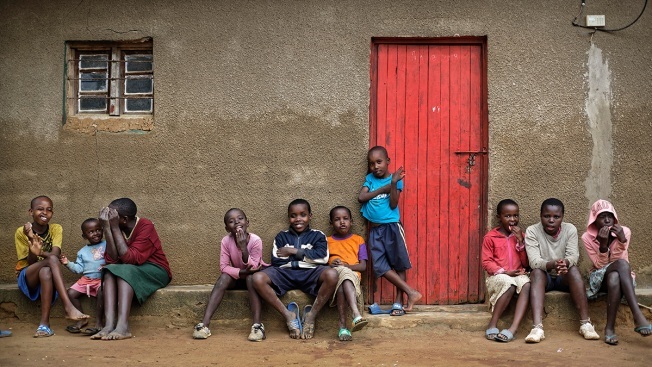 In this photo taken Thursday, April 4, 2019, the children of genocide survivors and perpetrators play together in the reconciliation village of Mbyo, near Nyamata, in Rwanda. Twenty-five years after the genocide the country has six "reconciliation villages" where convicted perpetrators who have been released from prison after publicly apologizing for their crimes live side by side with genocide survivors who have professed forgiveness. Twenty-five years after the start of a genocide that killed some 800,000 people, Rwanda is rebuilding with hope and shines with a new light, President Paul Kagame said at commemoration services Sunday. He said Rwandans would never turn against each other again. "Our bodies and minds bear amputations and scars, but none of us is alone," Kagame said at a ceremony attended by several heads of state. "We Rwandans have granted ourselves a new beginning. We exist in a state of permanent commemoration, every day, in all that we do ... Today, light radiates from this place." Kagame and other leaders joined in a procession later Sunday through the capital to the National Stadium, where thousands joined in an evening candlelight ceremony. "Twenty-five years ago, Rwanda fell into a deep ditch due to bad leadership, today, we are a country of hope and a nation elevated," Agnes Mutamba, 25, a teacher who was born during the genocide, told The Associated Press in Kigali. "Today, the government has united all Rwandans as one people with the same culture and history and is speeding up economic transformation," said Oliver Nduhungihere, Rwanda's state foreign affairs minister.